Keeping the connections between eyes, hands and heart open requires practice. My sketchbook is the tool I use to connect with myself and the world around me. A form of meditation, sketching is a fabulous way to stay in the present moment as it requires all of my attention. As my mind drifts, the pen drifts. Drawing keeps me on track. Both in my creative work and in my life -- there is no separation. Don't get the idea that I'm some sort of tidy, perfect sketchbook/scrapbook type. While I admire those people who naturally organize their experiences into tidy books, I've never been one. I keep little 3" x 5" sketchbooks (or larger) in the car, my purse, by the phone and other places to record a moment when it hits me hard enough to move my pen. Pages may be weeks, months, even years apart in the same book. I'm not a picky sketcher. Ink pens are my favorite because drawings made with them don't smear easily. And, I don't sketch to a "finish". My pieces are usually only a matter of minutes long. Fifteen minutes for a quick sketch is my usual limit, 1 to 5 minutes is more likely. That seems to be either the time I have or my attention span. Either way, the result is the same. 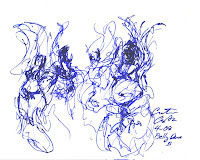 Dance is a particularly favorite thing for me to draw. I love the fluid movements and focused energy. The challenge of drawing moving subjects entrances me. 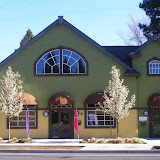 Last week I attended the High Desert Belly Dance Guild's April Showcase in Bend, Oregon, an exhibition of a variety of dance styles from several of the Guild member teachers and students. 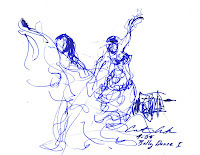 Fascinated with dance, I started taking belly dance lessons last fall from my friend, Kathy Southwick, a life-long dancer. Her class is fun and her music mix always inspires an extra shimmy. Attending the dance class gives me insight into feeling my visual experiences kinesthetically. Sketching is a way to feed and educate my art from the inside, rather than always looking for external influences such as style, fashion or concepts about what defines good art. Remember, these images are copyright protected. Please do not copy them without my permission. Too much of something sounds like paradise when there's a shortage. Which is exactly why there is now too much corn in the U.S.A. food chain. During the mid 1970's the opportunity to "feed the world" was the cause taken up by the United States government. They supported the growing of more corn so well, that corn has become the preeminent grain. Not that corn is a bad thing. I love eating corn tortilla chips, corn bread, and other dishes obviously made out of corn. I've even made a retablo in the Hispanic tradition of sacred art, titled La Conquistadora / The Corn Maiden. The indigenous peoples from the High Plateau south through the lands of the ancient Mayans, cultivated and revered corn. According to Michael Pollan in his book, Omnivore's Dilemma, Mayan descendants refer to themselves as the corn people. The phrase "I am corn walking" refers to the fact that the very substance of their bodies are mostly from corn. The problem for us in the North is that corn has infiltrated every level of our national food supply in a way that isn't so obvious. After reading Pollan and seeing King Corn, I visualize us as corn swimming in corn. In the U.S.A. meat animals like cows, pigs and chickens are fed corn, and it has infiltrated most processed foods in the form of high fructose corn syrup and other corn derived flavors and enhancers used in the food industry. 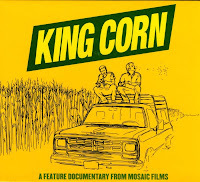 The feature documentary movie, King Corn - You Are What You Eat, a film by Arron Woolf, Curt Ellis and Ian Cheney is about this one food that has become so ubiquitous in our food chain that they dubbed it King Corn. Here in the U.S. we eat so much corn that the very carbon our bodies are formed of is according to carbon isotope studies, mostly corn (you'll see this test in the movie). The Bend Film Festival Indie Reels in Bend, Oregon featured the film King Corn (April 22, 2008), along with a guest appearance by Curt Ellis. I went with my movie-buddy Judy Shasek. In the movie King Corn, we follow Curt Ellis and Ian Cheney to Iowa where they buy an acre of land and grow corn. During his presentation after the film screening, Curt Ellis said that their intent was to learn about food and because there is so much corn, they decided on that grain. Following corn from the soil to the dinner plate, they share insights into the history and economics, environmental and health impacts related to the preeminence of corn in the average national diet. By the time we've watched them take the first bite of a corn cob fresh from their field and spit it out in disgust, we realize that there is more to corn than we may think. Despite the way the subject plays out, King Corn doesn't try to scare us as much as to make us aware of what's going on in a folksy, affectionate manner. As easy going in tone as King Corn is, there is work to be done and if you visit the www.KingCorn.net website you can click on the"Take Action" tab to learn how national legislation affects the food on our plates. I've been a fan of good food for all of my life and thanks to movies like King Corn, there is hope that other Americans will discover the connections between food and their quality of life on all levels. Sharing that message, my daughter and I helped Elliot Sawyer with a little film about the dangers of high fructose corn syrup in the diet. Elliot Sawyer is a young film maker in Bend, Oregon with a message. He's out to get everybody healthy and make them laugh at the same time. He produced and directed the Anti-Nutri Funnel piece. He also acts in it along with Judy Shasek, my daughter Isabella Barna and me. It was fun to act in this piece. In real life we eat very little of the bad stuff. Click here to see Anti-Nutri Funnel. I love fashion, but slavishly following fashion is not good for our planet. Fast food and fast fashion are responsible for environmental degradation. Yes, I love to get a good bargain and will buy the occasional item or accessory from a Big Box Retailer. But I'm aware that disposable personal and home decor fashion leaves huge carbon footprints. Globally and personally, we need to reconsider choices that lead us away from a sustainable economy and environment. The closer my choices are to expressing my authentic self, the less likely it is that those choices will result in buying a bunch of stuff I quickly decide I don't want, leading to another set of purchases that don't fulfill me. That kind of decision making doesn't support a happy life or a sustainable global environment. How does this relate to choosing paint colors, flooring, furnishings and other home decor? The process of choosing colors can put you in touch with your authentic self. Here's why. The more conscious you are when you make a choice, the more authentic that choice is, and the less likely it is that you'll soon discard your decision. When the process of choosing colors for your home engages your deep desires, not only your aspirations, you are connecting with your authentic self. Like any thing, this won't work for everyone. But it is a way to access deeper meaning that works for me. Color is non-verbal. The colors we are drawn towards speak to us about our lives. The soft browns of a favorite coffee drink, the colors of the soil and plants around a favorite place, the warm tones of skin, hair and eye colors we are most familiar with are all things subconsciously feeding our desires for a particular color. So, how do you know what colors you really want? Look at the colors you desire. When the voice pops in your head that tells you what you "should" want, tell it to go away, and reach for a sample of that paint color that you are sure you "shouldn't" use, but you are fascinated with anyway. Consider this color sample thoughtfully. You may not end up using the exact color in your decor, but at least you will have acknowledged your desire before you make your final choices. The more authentic your choices, the less you'll feel the need to rely on fashion color trends that have little to do with your life. And if a color trend does resonate with you, you'll be making a conscious choice rather than buying something because it seems like the thing to do. The increased consciousness you bring to the purchasing process will have a ripple effect. Each purchase we do or don't make has a result that is felt in both our economic and natural environment. Increased consciousness leads us to consider the effect of our choices on the greater community. And I believe that a change of consciousness is the first step to sustainability. Note: One company that I admire for their continual openness to environmental/economic sustainability and a more conscious life, something they title Leading the Examined Life is Patagonia. Thank you to The Source Weekly in Bend, Oregon and journalist Jonas Cohen, for the feature article about me that they are running this week. I really appreciate the visibility press coverage gives my creative work. Jonas Cohen was easy to talk with and a very nice guy, he made the interview process very pleasant. Walking through the aisles of a natural foods store I'm lulled into thinking that buying the latest salty snack with the word "organic" plastered all over the plastic sack will save the planet. Yes, it's better than eating a GMO (Genetically Modified Organism) conventional product that's similar, but there's a lot more to saving the planet than falling prey to some marketer's labeling of an ultra-processed packaged edible as "organic food." So what does this topic have to do with the creative life? More than you might think at first glance. Creativity and our willingness to embrace positive change are integral to changing the course of planetary environmental degradation. I got started thinking about this while drawing the chili peppe r plant growing in my house. Though it's officially spring in Bend, Oregon, it is in the 20's and snowing today. Growing in the sunshine of our upstairs window, this perennial plant is an abundance of bright green leaves teamed with a few dozen slender, brilliantly red & green, small chili peppers. I let the chilies ripen red and dry on the vine, then I crumble them over salted, roasted peanuts for an afternoon snack. Sometimes I put them in a salsa or red chili sauce. The unique thing about this chili plant is that it is native to New Mexico, the home of my paternal grandmother's ancestors. I like eating a food that enriched the lives of my ancestors for generations. You can buy seeds for this and other native plants at Native Seeds/SEARCH. Native Seeds/SEARCH is a non-profit that is striving to preserve the genetic diversity of our country's South West heirloom and indigenous food and utility crops. No matter how "organic" our food is, if we continue to lose biodiv ersity, our food supply can be easily jeopardized by diseases or other unforeseen problems. Native Seeds/SEARCH describes themselves thus: "The Native Seeds/Search Seedbank houses, for future generations, the seeds of crops and wild plants traditionally used as food, fiber and dyes by prehistoric and more recent cultures inhabiting the arid southwestern U.S. and northwestern Mexico. . . approximately 2,000 different accessions of traditional crops grown by Apache, Chemehuevi, Cocopah, Gila River Pima, Guarijio, Havasupai, Hopi, Maricopa, Mayo, Mojave, Mountain Pima, Navajo, Paiute, Puebloan, Tarahumara, Tohono O'odham and Yaqui farmers. Over one-half of the collections are comprised of the three sisters -- corn, bean, and squash. An additional 48 species of crops and wild crop relatives wait in frozen storage, including amaranth, tepary bean, chile, cotton, devil's claw, gourds, melon, sunflowers, tobacco, teosinte, watermelon and wild beans." The "Three Sisters" of corn, beans and squash are the crops that the American Indians considered necessary to support a settlement. 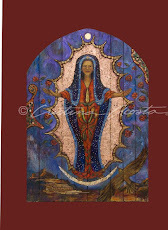 Honoring these indigenous crops and that American Indian heritage along with the Spanish heritage of the American Southwest, I painted a Santos style retablo of my Madonna, Guadalupe with the Three Sisters: Corn, Squash & Beans.This retablo is part of my Hispanic Culture Sacred images series. If you live anywhere in the American Southwest, or if like me, you have a sunny window, I encourage you to look through the www.nativeseeds.org website. They sell heirloom seeds, baking mixes, spices, art, goat milk soap, even Christmas ornaments by Hopi artist Gerald Dawavendewa and others. Another thing they do that is so generous both individually and to our planet is their Native American Outreach program where they give a certain amount of seeds to American Indians for their gardens, along with Adopt A Crop program to keep those seeds viable. They also have a Cultural Memory Bank Project that pairs the knowledge of the geneticist with the folklorist to conserve not only the plant, but how that plant was nurtured and utilized. Art and Science together for the good of our planet. Now that's creativity! Long before the environment became the latest cool and groovy cause to get behind, there were companies that were working for the cause. Timber Pro Wood Coatings in Portland, Oregon is one such company. 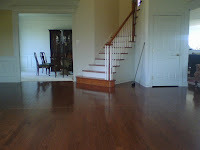 This small company specializes in what they call Enviro-Safe wood stains and sealers. Their products are commonly used on log homes and natural wood siding and decking. If you want to preserve cedar or wood trims on the outside of your home, seal a wood deck or log home, this is the stuff. I've even had a color consulting client use Timber Pro wood stain on her interior wood ceiling. I especially endorse this product because my sister-in-law and brother-in-law, Sheri and Will Steber, own Timber Pro Wood Coatings and I completely admire them for getting on the environmental bandwagon in the 1990's, long before it was the cool thing to do. Last Week to Cast Your Vote for Your Favorite Green Home Solutions Voting for the 2008 GREEN LOG Home & Lifestyle Awards kicked off April 7th. With votes pouring in, we are excited to see which companies, web sites and products emerge at the top of the list. With the public votes in, some of our esteemed nominees will be elevated to Finalist status!Voting closes on Monday, April 21st so if you haven’t gotten your vote in yet, do so this week! This is your chance to let the public know which companies have the “best of the best” green solutions and which web sites provide the best green information. As voting closes, the list of Finalists will be sent to an expert advisory panel at Environment News Service. This panel of judges will determine who the 2008 Green Log winners are! For another source list of Green Building suppliers, see Oikos.com. In the 1980's (even longer before it was cool), Bruce Sullivan was pitching the planets health. He and his wife Beth Magee developed a web site that is a good source of information regarding anything to do with environmentally sensitive building. 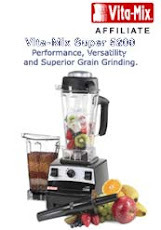 Their site is a wonderful resource for green and sustainable products. www.Oikos.com Included on the site is a book store. Have you ever picked up a camera and taken a picture? Of course you have. And you probably put the photos online and send them to your friends and family. Now and then a doting relative passes on a uber-cute photo to their friends. But no matter how large your circle is you'd never expect to see that same photo in some corporation's national ad campaign without your permission or payment. That's the future folks if the Orphan Works legislation passes. In fact, it's already happened. It's just going to get brazenly, egregiously worse and it will be virtually impossible for the little guy (most of us) to do anything to rectify this theft of our intellectual property. Follow the money on this bill and you'll realize that big business stands to gain. Everybody else -- photographers, painters, sculptors, designers and the ordinary guy or gal with a camera will lose, BIG. If you're an artist, don't fool yourself thinking that theft is some form of flattery. This is about your bottom line. No cash and you aren't able to work. The copyright laws as we know them will be gutted. Getty, Corbis and other media supply agencies will have free rein to use your images without ANY payment to you. And, it only gets worse. Individuals and businesses will get on the bandwagon. An image of your painting or design work could be put onto paper plates, tissue boxes, beach towels, calenders, stationary, ad campaigns and you'll get nothing except a sinking feeling when you walk into some retailers shop or open a magazine or book and see them SELLING your work and you get NOTHING! Not only is your financial income compromised, you will have to pay to get an attorney to deal with this theft (and you may lose!). "Remember: the US Orphan Works amendment is not an exception to copyright law to permit the archiving and preservation of old, abandoned works. It is a license to infringe contemporary works by living artists worldwide. Its goal is to force these works into private commercial US registries as a condition of protecting copyrights. Coerced registration violates international copyright law and copyright-related treaties. To concede defeat on it is to knock a hole in copyright law and admit a Trojan horse." Illustrators Partnership.org a Graphics Art industry non-profit group has many helpful links and more information on their site at this link for the IPA Orphan Works resource page. Please take a few moments to contact your legislators. Remember, it's the people who show up who run things. Have a voice and show up for this issue. CONTACT YOUR LEGISLATOR: Go to http://www.usa.gov/Contact/Elected.shtml to quickly find the phone number, address and e-mail of every U.S. senator, U.S. representative, governor and state legislator. Some creative projects have definite parameters, like building a bridge or constructing a home. Create a plan, follow it, finish it and move on. In reality there is always a little cross-over between the two phases. Some challenge not considered in the plan has to be creatively solved during the production phase. The bigger the project, the more important that most of the creative work is finished in the planning phase, as resources and time may not be available to make many mistakes during the production phase. A smaller project, like painting a small image or composing a song can be more flexible (less resources of time and materials are at stake). The trick for me (and other highly intuitive types) when we plan is to not feel hemmed in by the original plan. I know enough now about my creative working process to nurture my strengths. I became very aware of the importance of planning a large painting when I painted billboards in the late 1980's. Until then, the most I would do before beginning a painting was a cursory sketch, and I'd often skip that step, preferring to work the sketch out in paint. When the painting became 24 feet long and 11' tall, there was much less room in the time and materials budget to make a mistake. For the most part, I eliminated as many errors as possible before I got to the production phase of the painting. Planning was crucial when I illustrated a children's book, setting up the 17 paintings necessary for the text. I had to paint them all at the same time to ensure the same exact style from beginning to end. Because my style is very fluid, I knew that I would "loosen" as I painted the images. By planning a synchronized completion of the images, I ensured that the final pieces would fit perfectly together. When I'm putting together a large project, I am most creative when I work with people who have a certain comfort level with what appears to be chaos (but is actually creativity). I recognize the downside to my strengths (sometimes referred to as a weakness) and set up a safety net. I'm not linear or tidy, and my organization style tends to look like a big wind swept through my studio. Hiring an organized, linear, tidy helper to handle the accounting and to keep my routine administrative tasks in order is one of the ways I plan for success. That leaves me free to do what I do best, and when that happens, my projects are much more successful. Painting your home is the most inexpensive way to get a totally new look with the least investment. Nonetheless, it is still an investment. Hiring a painting contractor may cost several thousand dollars. Painting your home yourself may cost close to one or two thousand dollars depending on the size of your project. Asking yourself a few questions in the early stages of planning your project will save you time and trouble. If you're only in the home for a year or two, then expect to resell or rent, keep your color scheme a little on the impersonal side with personal accents. Ignore this advice if you don't care about spending more money on a repaint within the year. If you're planning on living in a place more than 2 years, be creative. There are no guarantees in life, so choose what you love so you can live in a home surrounded by choices that you love. Be as wild as you want to be. When the time comes to sell, you can include funds for a repaint if you think it would motivate a buyer. Many buyers will re-paint anyway, regardless of the colors you choose. Will I (or we) do all of the painting? Some of it? None of it? Painting Yourself: Take some time to review application tips. Paint companies are continually refining their products. Some application methods are better than others, depending upon the condition of your walls. Ask your paint store salesperson for up-to-date tips. You'll also find tips on pamphlets in the paint store or on the paint brands website. For even more help, Google house painting tips. Hiring a Painter: The best choice is a professional painting contractor that likes doing owner occupied repaints. This is an important thing to know. Some professionals are geared more towards commercial jobs that don't require a personal touch. Ask to see pictures of other jobs and follow up with their references. You can hire a painter for the "hard" parts of the job (high areas, trims) and do the easier parts yourself. If you like that idea, be honest and upfront with your painter so that he/she can bid the job accurately. Ask the painting contractor for a bid that separates paint/product cost from labor. That way, you can consider the financial cost of the paint quality separate from the labor cost. There are different quality levels and prices of paint. Don't get a substitute for the brand and level of quality house paint you really want. Quality Counts! A high quality paint has more solids and higher quality pigments. The result is paint that is easier to use, requires fewer coats (less labor), cleans easily (depends on the finish), lasts longer and resists fading and wear. Buy the best quality paint you can afford. Read more of my color consulting articles on my website. Sisters, Oregon only has a couple of thousand residents, yet the town is anything but small-minded. Residents are generous with their time and money to support a variety of cultural and educational opportunities for the residents and visitors. Katy Yoder, my wonderful friend directs the Sister's Folk Festival My Own Two Hands Art Auction, in Sisters, Oregon. I donated a painting valued at over $3,000.00 (it's in a Beautiful frame!) along with a copy of Paint Happy! The Sister's Folk Festival staff & a small army of volunteers put on a great party for a worthy cause; Visual Arts & Music education in the Schools. Live music, great food, original art and fun people make this event the art auction of the year. 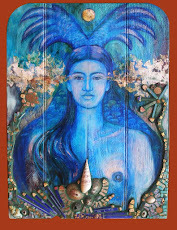 If you can't make the date, you can bid by phone on this painting by calling the Sister's Folk Festival at 541-549-4979. 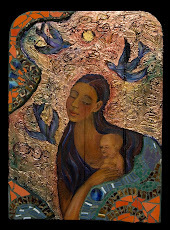 It's beautifully framed by award winning framer, Myrna Herrick Dow of the High Desert Gallery in Sisters, Oregon. Myrna donated the framing and her gallery, High Desert Gallery is exhibiting this and other paintings during the art stroll Saturday afternoon/evening. I 'm not sure how late into the evening you can bid, so contact the Sister's Folk Festival at 541-549-4979 for proxy bidding. All of the proceeds go to a good cause, so bid high! This painting celebrates the eternal Spring. Birds fly to the window to inspect the houses. Maybe they'll start a new life here. Potted plants and flowers are sprinkled with blue flowers (or is that wallpaper!?). The world is a fresh and happy place where creativity and inspiration are born. This painting is featured in my book Paint Happy! Check out the Sister's Folk Festival, My Own Two Hands art auction page and you can see all of the paintings, sculpture and other donated art. Every bid you makes supports and enriches the lives of the young people in this community. Thank You! Ask Cristina: What Colors Complement Hardwood Floors? The first way to decide what to do when you're "fighting" with a color is to identify how the color is functioning in your master palette. Each color in your palette has 2 identities. The first identity is the color's name -- for example: red, blue, brown, etc. The second identity each color has is it's relationship to surrounding colors. Here's an example of how relationship changes your perception of a color. In the canyons of the American Southwest, colors of red rock are everywhere. Drive through red rock canyons and you eventually become numb to the color red. Red is now functioning as a neutral. A green tree visually pops out at you. In this situation green is an accent color. As you know, red and green are rarely referred to as neutrals in home decor. Yet, in a design context similar to what I've described in the natural world, they could be. The most common understanding of a neutral is as a color without much of a name identity. Colors with names like beige, taupe, stone, etc. are the grayish and brownish tones often referred to as neutrals. What this means to you is that for a color to be neutral with your existing foundation color palette, it would have to have orange/red tones in it that refer to the color of your floor. (This can be a subtle reference.) When a color refers to another color, both look intentional. If you have a color you don't like and you ignore it, the overall effect of your interior design will be weakened. That said, you also have another component to the colors of your foundation color palette. The floor color of dark orange/red is contrasting with the white wainscot and trim both in value; the floor is dark (on a scale of 1 to 10 it's a 8), versus the white (1 on the value scale) And in color temperature. 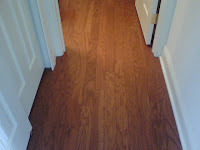 The floor color is "warm" versus the "cool" white (relatively) of the trim. Dark wood (a 10 on the value scale) furniture in the background works well with the value of the wood floor. Keeping your trim and wainscot white looks nice and reinforces the traditional lines of the home. With that in mind, your color scheme is one of extreme values: white and dark, without other values in between. Though sticking with that approach can be traditional to the architecture of your home, bringing in some mid-value tones as either neutrals or identifiable colors will create more emotional warmth. In rooms where you want to keep the color light, I would choose warm light neutrals such as brownish orangey/red tans and golds that refer to your floor color. In rooms with white wainscot, I suggest choosing darker warm colors (at least a 5 to 8 on the value scale) as they "stand up" well to the floor color. Because you have such sharply defined rooms (the white wainscott, doors, trim and crown molding on the ceiling), I suggest you paint the ceilings a color, not white. This will reinforce the definition. To choose colors that refer to the floor color, put the samples directly on the floor and make sure they look good against the color of the floor. For more specific and complete suggestions, I do offer phone/email consulting. I look at photos and walk you through the process of how to use a fan deck to identify colors. My service includes large paper color samples, a report and is billed by the hour. 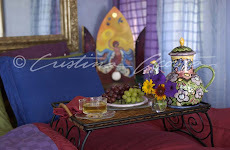 See a portfolio of my color consulting work on my site. Kitchen remodels are often the most expensive remodel of any room in the house. If you have laminate counter tops or cabinet faces you don't like, before you invest in entirely new cabinets, consider re-covering the existing laminate. Formica, Wilson Art and Pionite are popular brands of laminate (also known as "formica"). These companies continually offer new colors, textures and patterns. Here's how I used re-facing cabinets to save myself a bunch of money. Faced with a 20 year old kitchen with Euro style cabinets covered in a gray laminate that didn't suit my color palette, I decided to investigate new cabinets. Estimates ranged from $20,000 and up to put in new cabinetry. 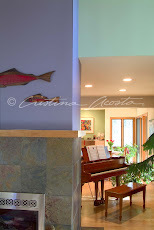 My husband and I decided to spend our remodeling money on new environmentally-friendly windows, plumbing fixtures and flooring (we stretched those dollars with a lot of our labor). After those expenses we had about $1,000 left for the kitchen. We were not very hopeful about any changes we could make. I had done everything I could with paint, but the gray cabinets were still the dominate feature and they didn't work with my foundation color choices. Remembering cheesy ads from years ago about "cabinet refacing", I decided to investigate how I could take that re-facing idea and come up with something cool. Looking under "Counter tops" in the Yellow pages, I found a company that advertised Laminates. I visited their showroom and discovered that laminates can be pretty cool. Formica re-issued some 1950's versions that I fell in love with: Boomerang, offered in Mint, Pink or Gray made me smile, remembering California bungalows from my childhood. Wilson Art makes a eggplant purple that was better than anything I could have thought of. I realized that using the accent wall concept, I could break up the dominate gray color in such a way that the gray would look intentional not ignored or tolerated. Bev-Art, the company in Bend, Oregon put me in touch with their installer, Doug Patterson. He came to my house and after inspecting my cabinets told me what he could do. Because the doors were so finely hung, there was no room for refacing them without a lot of expense, I settled on refacing the sides of the kitchen island and the front panel inserts of my dishwasher and refrigerator. I choose a deep eggplant color. Doug Patterson cut the panels on site and laminated them to the old gray cabinets. I LOVE the result! I still have gray cabinets, but now, the color is broken up and enough of the bold eggplant purple laminate exists that the gray no longer dominates. The eggplant purple color is a wonderful accent color in the kitchen. Remember the Boomerang Formica I mentioned? Still in love with it, I had Doug install it on the existing gray counter tops in my Master Bath. It adds the touch of fun my overly serious modern cabinetry was lacking. Info in Bend Oregon: Bev Art Counter Tops, 541-388-3457. Paint Happy is the name of both my art book and the series of paintings I make in that style. When I paint, I hold a thought/emotion in mind as I create. My Paint Happy series encourages happy, joyous thoughts. It's always a pleasure to make and to share with viewers and collectors. I'm happy to announce that High Desert Gallery in Sisters, Oregon is now the exclusive representative of my art in the Central Oregon region. Along with representing some Paint Happy pieces online, Myrna Herrick Dow, a partner in High Desert Gallery, is an award winning framer. She has framed several pieces in the series -- gorgeous! The High Desert Gallery is also hosting the preview of the painting Springtime All Over - The Garden Store. I donated the original painting to the SIster's Folk Festival, My Own Two Hands Art event and auction. High Desert Gallery donated the framing. It's a wonderful cause: Art & Music in the schools. You can proxy bid by phone through April 12th. Another wonderful public cause is the Jacobs Gallery in the Hult Center in Eugene, Oregon. 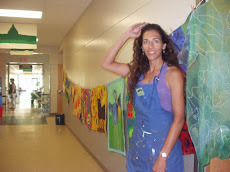 The Gallery is a Non Profit organization funded through private donations, the City of Eugene and the sale of art. Latino Visions, a invitational exhibit of ten Northwest Hispanic artists, curated by Analee Fuentes, is open April 4 - May 17th. I'm proud to share 3 of my large Madonnas in that exhibit. As the April days lengthen, warmer days that aren't too hot make for ideal house-painting weather! Ok, it's doesn't sound exciting, but it is a necessary chore if you own a home. To make choosing colors for the exterior of your home a little easier, I put together a collection of paint color choosing tips for you. Reading has always been one of my loves. Surprising to me is that the list of good books I think have been the most important in my life, changes over time. Not only because a new book has usurped an old favorite, but because a book I read many years ago and may not have thought of as life-changing or "good" (in the Great American novel sort of way), gets on the list. With the perspective of time, my understanding of a book changes and I realize the important positive impact of that particular book. The Tassajara Bread Book (pub. in 1970) is this kind of book. When we were young teenagers my sister, Alisa Acosta, and I taught ourselves how to bake from this book. Alisa focused on popovers and other such things. I delved into bread making. Edward Espe Brown's detailed, concise directions coupled with his intellectual and spiritual generosity resulted in a book that touched so many people that it became a international bestseller. I long ago lost my copy of that cookbook and had mostly forgotten about it in a everyday way until I saw the Indie film, How To Cook Your Life, with zen chef Edward Espe Brown, author of The Tassajara Bread Book and other books. Ed Brown (that's how he was introduced) made a guest appearance last night (April 1, 2008) at the Tower Theater in Bend, Oregon. The film, How To Cook Your Life, was shown as part of the Bend Film Festival Indie Reels screenings. Ed Brown introduced the film, then when it was over, he answered questions from the audience and told stories. His sense of humor coupled with his wisdom had us laughing and enlightened within minutes. He was a lot of fun. I had hoped to thank him for his work in person, but the receiving line was more than I was willing to wade through. The Tassajara Bread Book inspired and opened me to my love of cooking, and by extension life. Creating food with my hands puts me in touch with the land and elements that combine to create that food. A loaf of live dough ready for the oven embodies the cycle of life. Edward Espe Brown's writings planted the seeds of spirituality, environmental sensitivity, and a life-long love of food. His cookbook is not only a artistic inspiration, it is a political inspiration. The Tassajara Bread Book gently put me on a path that made the connection between the spiritual and practical accessible. I highly recommend watching How to Cook Your Life. It will be available on Netflicks in May 2008. Edward Espe Brown's writing inspired my artisan bread baking hobby. I now focus on a natural yeast starter that absorbs the life in the air around us. Read my artisan bread recipe on my website. Thanks Judy Shasek for inviting me to see this movie. Judy is a creative powerhouse. Among her projects is Generation Fit, an innovative learning/wellness outreach program for kids. Note: Photo of Edward Espe Brown is from the PeacefulSeaSangha.com site. More info is also available on the Tassajara Zen Mountain Center page.